I'm getting better at pleating dumplings. Remember (this post) when I first tried my hand at making Georgian dumplings? Well, they tasted great stuffed with cheese and jonjoli, but they weren't very pretty to look at. I'm still trying to get the dumplings thinner in texture, but I must admit they look a bit prettier than they did last year at this time! My dough is smoother, my hand is steadier and my pleats are recognizable as such. I've eaten khinkali at a handful of restaurants now. At some places they seem heavy. And, in the best of cases, they are utterly transformed into thin, light pillows stuffed with a minced meat mixture and brimming with scalding hot broth. 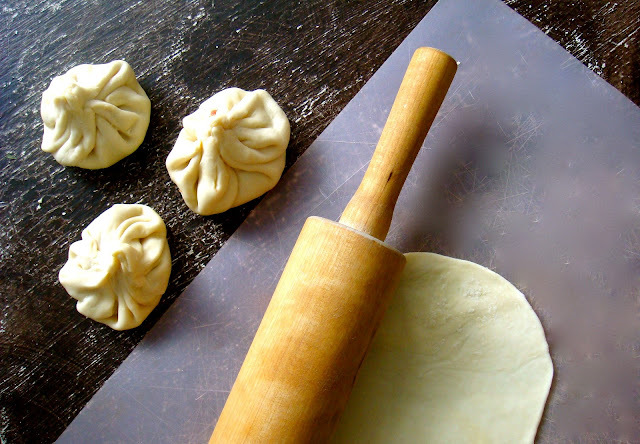 The dumpling dough acts like a little bubble and when you bight into it, steam escapes and the juices start flowing. My youngest shares my love for Khinkali. Often, we'll be sitting at our favorite restaurant and when the dumplings are served on a big blue tray, his eyes widen to saucers and the same crazed smile on my face is recognizable on his. He perches himself in front of me. I pierce a dumpling, through its topknot, with my fork. The dumpling draws closer to me and before I can lean around his little head, he jams his jaws into it-- sending an explosion of juicy broth trickling down my forearm. We laugh and then begin our jovial fight for the rest of the dumpling. If you want to try to make your own Khinkali, I'm still using the same dough from the previous post. But, instead of stuffing with cheese, follow the recipe below. Saute 1 finely minced onion over medium heat. Once wilted, add 2 pounds of ground meat (traditionally a combination of beef, lamb and pork are used). Once browned, add 1/2 tablespoon of ground caraway seed and a 1/2 cup of finely chopped fresh green herbs (whatever is on hand, but parsley and dill are often used in Georgia). Cook until well combined and add 1/2 cup of water. Season with salt and pepper and simmer until the water has evaporated. That is a great picture! I'm looking forward to making these in my own kitchen. Thanks for the recipe! © 2011-13 Shelby Benny Reynolds. All rights reserved. Powered by Blogger.